Coloured storage units that double as cubby-holes and hiding places for children feature in this Stockholm kindergarten by Swedish firm Rotstein Arkitekter. Rotstein Arkitekter designed the L-shaped space on the ground floor of a residential apartment block, with the kindergarten's entrance in the middle. Cubby-holes in the common areas are yellow, while each of the three classes has its own signature colour. "We envisioned a playful environment designed to encourage and inspire the creativity of the children," said architect Anders Rotstein. A small hut with a glass window is located on the first floor with views over the rest of the kindergarten space, providing a place to play or sit and read books. The staircase widens towards the bottom for use as an amphitheatre and there's a darkened hideout underneath it. Each classroom has three windows - two large and one small - to offer views in from the neighbouring street, while windows between classrooms visually connect spaces together inside. Another project in Stockholm by Rotstein Arkitekter is an apartment with an open-plan, monochrome living space. Other kindergartens we've featured include one with a play area of wooden blocks shaped like a mountain, another with a cloud-shaped courtyard enclosing six mulberry trees and a small wooden nursery in a public garden. Rotstein Arkitekter has designed a kindergarten on the ground level of a new residential block in Stockholm. We envisioned a playful environment designed to encourage and inspire the creativity of the children. The entrance is situated at the centre of the kindergarten, with an abundance of natural light and sight lines through the building. The entrance space flows into the two studios, each with two connecting group rooms. All group rooms have three windows facing the lane outside: one placed low, one high and one bigger than the others. These scattered windows offer the passerby views of the activities from the outside, thus revitalising the street. Windows between group rooms open up sight lines within the kindergarten itself. 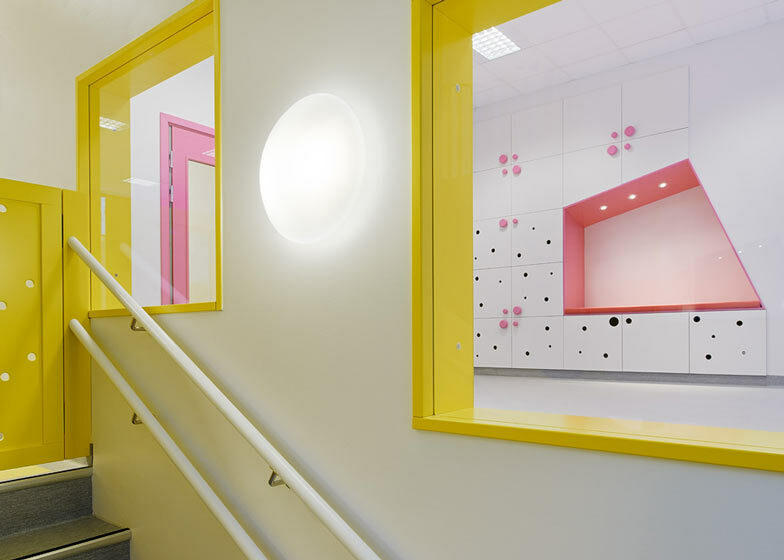 The kindergarten is also a play with colours; yellow elements in the common areas and one specific colour for each department.Many of the units were designed to serve multiple purposes. For example, the storage units are built into the walls as coloured niches, serving also as caves and huts for the children. A sculptural staircase leads down to the workshop. The stairway becomes a place for parallel activities. It also functions as cabin, lookout tower, forest, cave and platform. When descending the stairs it widens, turning into an amphitheater like area. This is the perfect place for play during the day. A quieter and darker room has been created underneath the stairs: a secret hideout. Some of the interior design budget was earmarked for solutions with architectural qualities, specific for this space. Using built-in storage units and niches is space saving. Maximizing the room height makes a huge difference, especially when it comes to the acoustic environment. Sjötorget is a kindergarten created by Rotstein Arkitekter, as part of a new residential block built by the developer JM at Liljeholmskajen in Stockholm, and designed by the same architect.